Launch of two new fast charging points for electric vehicles at Parkers Lane in Broomhill. Pictured are Coun Jayne Dunn and Mark Daly from Sheffield City Council. Two free charging points for electric cars have been installed in Sheffield. The points at car parks on Carver Street, in the city centre, and Parkers Lane, Broomhill, allow cars to be fully charged within three to four hours. 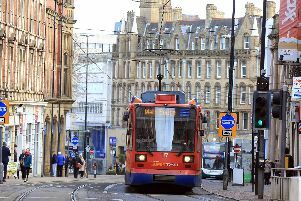 They are two of more than a dozen which will be installed across South Yorkshire over the next 12 months after the county was awarded £225,000 from the Government towards the scheme. Coun Jayne Dunn, Sheffield Council cabinet member for environment, recycling and Streetscene, said: “The charging point in Broomhill is the first to be installed in the suburbs. “Broomhill has a problem with air pollution, so it’s brilliant the scheme has decided to put one of the charge points in this area. The Inmotion Electric Vehicles Scheme is a partnership between Barnsley, Doncaster, Rotherham and Sheffield councils and South Yorkshire Passenger Transport Executive. The rollout of public access charge points across the county forms part of a Government initiative to encourage South Yorkshire businesses to make the switch to electric vehicles. South Yorkshire was awarded about £225,000 from the Department for Transport in 2013 to increase the number of electric car charging points - £75,000 was given in 2013 and a further £150,000 last year. Companies making the switch to electric vehicles can also benefit from low running costs of about £2 for 80 miles, no road tax and a reduction in exhaust emissions to help create healthier and cleaner roads in our region. He said the locations were chosen by the level of footfall, the adequacy of parking and the electricity supply. A charging point has also been installed in Drummond Street, in Rotherham. There are also ultra-fast charging points at Meadowhall Shopping Centre.